The world of Groo has grown over the years, and now it's time to explore the people the bumbling barbarian has encountered in a new series that is the best Groo book in years. 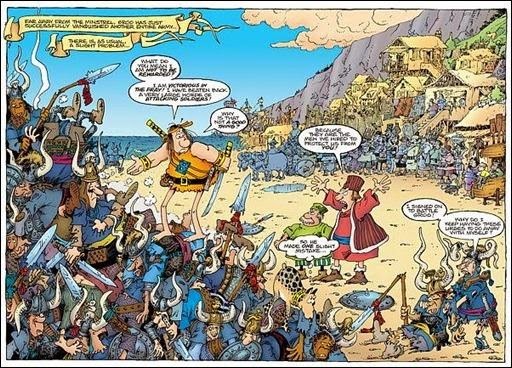 While I am in lockstep with Aragones and Evanier's politics, I felt like Groo was getting rather ham-fisted, with the mini-series about global warming possibly being the nadir. I do enjoy political satire, but when it starts becoming so obvious that the story suffers, my interest flags no matter how much I like the character or the creators. 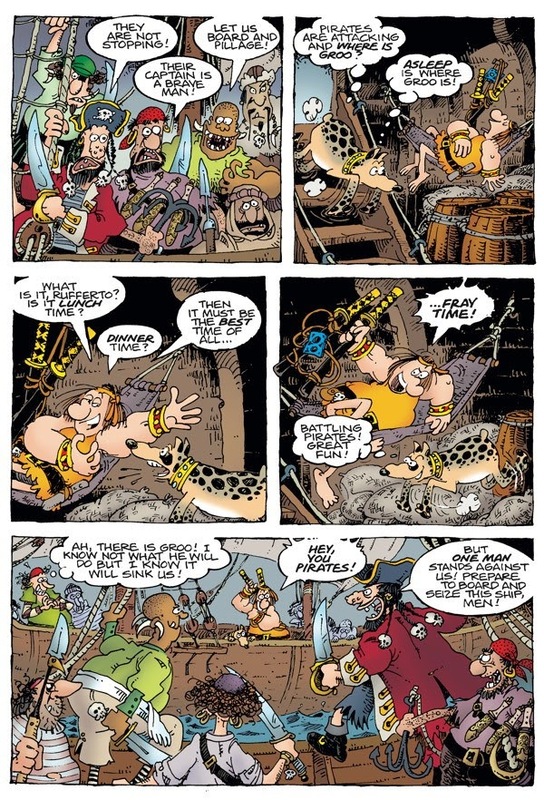 That's why this one really sang to me--it certainly has some modern allusions (like betting on a market failure, in this case Groo destroying anything he touches) but the story itself is just about how Groo is completely uncontrollable. For this first issue (of 12! Yay! 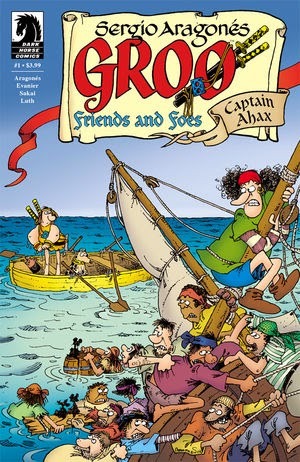 ), we meet Captain Ahax, a man who's had the misfortune of having Groo among his crew one too many times. When Groo, fresh off beating down an army designed to protect a town against him, decides he needs to get away, and finds that the ocean is "in his way" he signs on with Ahax, who knows that he's doomed. Or is he? A plan is hatched, a Groo is greeted, but in the end, the best laid plans of any man are no match for Groo's unpredictable nature. Groo's lines, freed from having to be the set-up to more serious discussion, are a ton of fun, especially the sequence where he tries to figure out how to understand that which he doesn't understand, a great piece of vaudeville wordplay. Meanwhile, Ahax's schemes give us a nice plot, as he digs himself in deeper and deeper. While the story may not be entirely centered on Groo, he figures in it prominently, and gets plenty of space to mess things up, including an end moment that puts a nice coda on a really strong one-and-done story. At this point in time, is there really anything else to say about Sergio Aragones? The living legend continues to be at the top of his game, drawing incredibly detailed page after page, putting more work into his backgrounds for one issue than most creators manage in a lifetime. The Mad Magazine legend is still able to do visual comedy like no other creator, making sure the figures create broad emotions around Evanier's words. He's simply amazing, and the fact that his work in 2015 is every bit the equal, if not better than what he was doing thirty years ago defies all logic. I can't imagine there are too many people reading this who don't know of Aragones' work, but if you've never seen it before, you're in for a treat. The way he can keep things looking extremely animated while keeping characters frozen long enough for a pretty good gathering of word balloons is a real talent. (Now I'm imagining him taking on a Bendis book.) While his characters are Looney Tunes-like in terms of design, they feel extremely human, and he always makes sure everyone, from the main characters to the barmaid carrying 4 mugs of ale (in two different styles, no less) are fully-formed. Just a clinic on cartooning, and arguably a one of a kind individual. I couldn't be happier that Groo is back, and with a maxi-series to boot. If all the remaining issues are this good, then we could be looking at the best work from Evanier and Aragones in decades. Make sure you get on board now!